I was greatful to of had alot of other bloggers agreeing with me and today it has inspired me to write a post on things that I feel should be the reason you are blogging today. Your Blog has it's category: Many of us have a blog that falls into a certain category; It could either be Beauty, Fashion, Lifestyle or even a Fitness blog. Always remember to enjoy it and never feel forced to do so. Don't feel the need to write about something you do not agree with or don't have enough knowledge on. Social Media: With social media, getting your blog out and in the open on the net has become so easy these days. Make sure you Set up accounts with the same name of your blog and linking them to one another, like that your readers will find it easier to track any post or videos you create. Make Friends & Support & Meetups: Since bloggers are all over the world, one thing the social media has done was brought us all together under one cloud. I have made so many great friends from interacting with other bloggers on twitter/instagram and replying to a question or a comment. Why not Retweet a tweet that a fellow blogger just shared regarding a new blogpost? Onto Meetups, I have successfully been to at least 5 or so meetups with my fellow Maltesers and I have gotten to know them like they were my best friends all along. You might feel awkward going to one at first but as soon as you start chatting away, you would be surprised on how well you could easily get along. Remember most of them are interested in the same things as you! 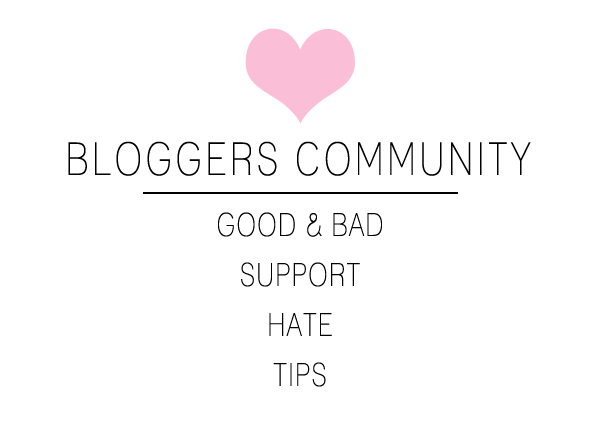 STOP the Hate/Jealousy: One thing that I hate is the hate some of my fellow bloggers/friends have gotten. Before you feel the need to get jealous over another bloggers Followers number or how popular she is, why not turn that HATE or JEALOUSY into SUPPORT. Support that blogger, they must of climbed that by focusing hard on her blog and enjoying it. Focus on making your blog the best Hobby/Job you have ever done. Be Proud of yourself. Don't get upset cause you don't feel anyone is taking the time to read your blog and feel you aren't there yet. Always remember, your favorite blogs you love to read have been there and have climbed that ladder by focusing hard and committing themselves to their blog. Layout/Template: "Oh wow, I love her Blog!! I wish mine could look that professional". I honestly have heard this alot. Your readers aren't so fussed on what your layout looks like but the content that you have taken the time to write up. We all love a lovely clean and professional layout but not all of us are genious at photoshop. I have been blessed with a geeky brain and have been playing with photoshop since the age of 13 and a diploma in I.T. which involves coding and HTML. I am self-thought and have used tutorials all over the web and youtube tutorials to get to where I am today. If you really would like a professional looking blog, why not search for someone to do it for you as alot of bloggers have their on website and create gorgeous blog layouts for others. Stationary: I definitely recommend A Notebook or a Diary for blogging. I carry my blog diary in my bag at all times cause you really do not know when inspiration will strike. You could be driving along a coast road and come up with a fun idea to write about or even to film. I personally bought a FIVE YEAR Diary from WHSmith which I am hoping that in 5 years time I will be able to look back and read all the posts I have done. I write down each and every blog post that was done on that day and any other important notes relating to the bloggersphere. Business Cards: Last but never the least, business cards are the key to have in your purse wherever you go. As most of you know I have now dropped my sub-domain and am hosting my blog on my domain as I have taken down my Makeup Artist Website. With that being said, I'm currently designing my new business cards for my blog. These little babies are your blog, you will be able to swap them with other fellow bloggers for exposure and even if you are invited to blogger events. Keep them in handy where ever you go as you never know who you might bump into. I keep my business cards in a lovely silver bussiness card holder with my name ingraved on it which i bought on vistaprint! Check out these amazing blogs from amazing people I have met along my way through blogging. Remember, Join the community, Smile and Enjoy IT! I always look at the positive side of it all, It's so rewarding meeting so many bloggers out there that are passionate about their blog as much as I am with mine! aww thanks for the shout out hun - great post, I really enjoyed reading it ! great post i totally agree with you! These are amazing tips, hun! You have a lot of great advice and I agree with all of your thoughts. I had no idea you did your blog design yourself, it looks so nice :) & Thank you for the shout out as well, you're such a doll.